Highest quality, safety-critical requirements, an aggressive time-to-market schedule, and increasing technical and organizational complexity are fundamental challenges for the development of autonomous driving systems. Using the most proven development methods and tools is the key to success. But which aspects are crucial? Our customers developing advanced driver assistance systems (ADAS) and autonomous driving systems tell us, it’s all about excellence in real-time, and focus on event chains. The concept of event chains is relatively easy to understand, even if mastering the challenges is far from being simple. Event chains can be thought of as the path from an input, such as a sensor, through the required software elements, until the desired output, such as an actuator movement, occurs. Look for example at an emergency breaking assist. The maximum end-to-end latency must be less than 300ms from the point in time when an obstacle pops up, until the car starts breaking. The end-to-end event chain goes through 3-5 embedded control units (ECUs) and 4-6 buses. Several suppliers are responsible for their respective parts of the event chain; this is what they actually limit their focus on. Overall, it’s the OEM’s responsibility to ensure that end-to-end latency requirements are met under all circumstances. For today’s ADAS, about 50 time-critical event chains have to be jointly optimized to meet all real-time requirements. When it comes to fully autonomous driving, it will be well above 1000 time-critical event chains. 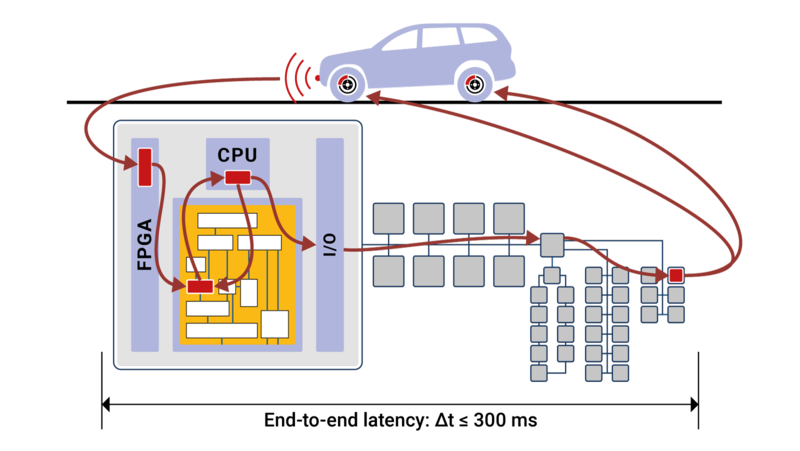 For such an increasing number of time-critical event chains, designing a robust and scalable vehicle architecture is as important, as it is for the system and software architecture of a single ECU. The flexibility to optimize the mapping of software components to cores, CPUs or ECUs will be crucial to avoid overload situation. Finding issues early in the development process requires virtual verification, as well as strong focus on event chains during the test phase. For all these development steps, the INCHRON Tool-Suite comes in handy, with model-based simulation and trace-based analysis & test.